Beautiful girls and Big Boys' Toys seems to go together! 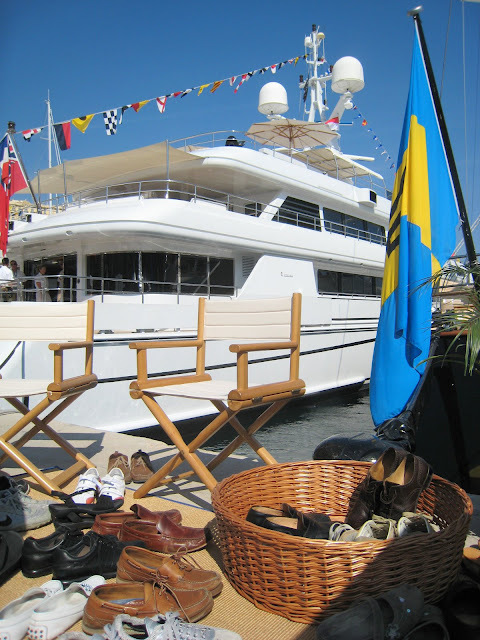 At the Monaco Yacht Show, girls (and guys too) are employed to show potential buyers around the yachts. Note: I really don't know the status of this pretty lady. The daughter of a friend of mine was working on one of the biggest of the massive super yachts and she explained that not 'anyone' can get aboard for a guided tour. Interested parties have first to make an appointment, at which time - presumably - their credentials are checked out. 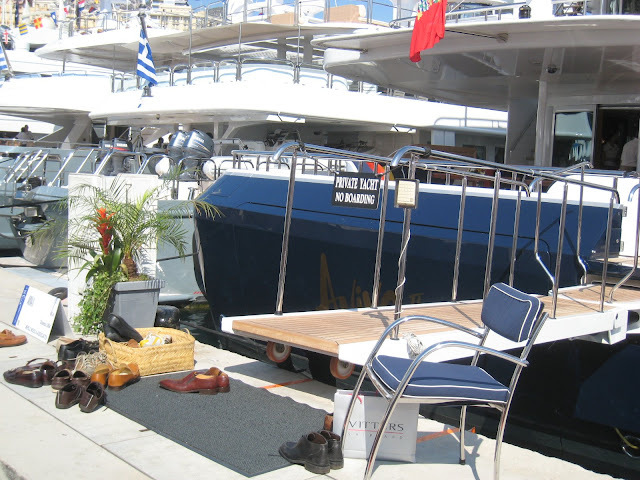 Visitors are ferried from one side of the Monaco Yacht Show to another. There are several hop on and hop off points for this. 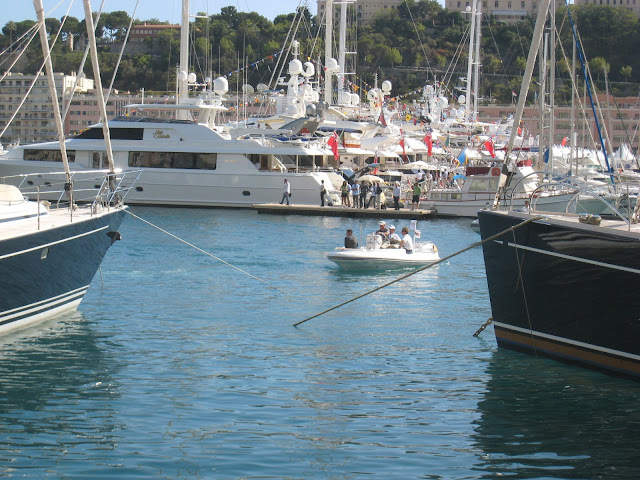 Not the Monaco Yacht Show, as such, but a photo showing you many yachts who had to relinquish their regular moorings in Port Hercules for the duration of the show. 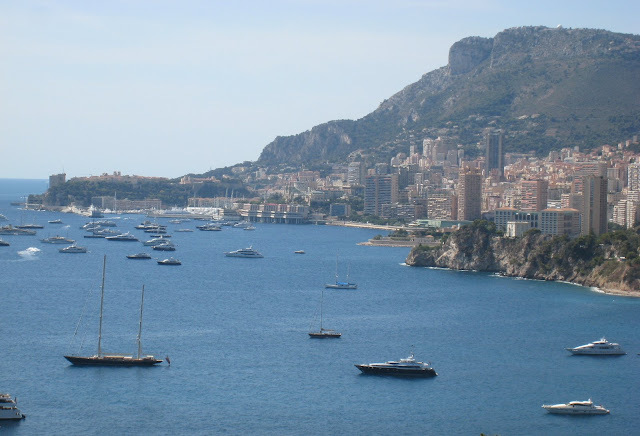 This is a view of Monaco from Roquebrune, taken on my way to the show. You can see the port with its gleaming white yachts. 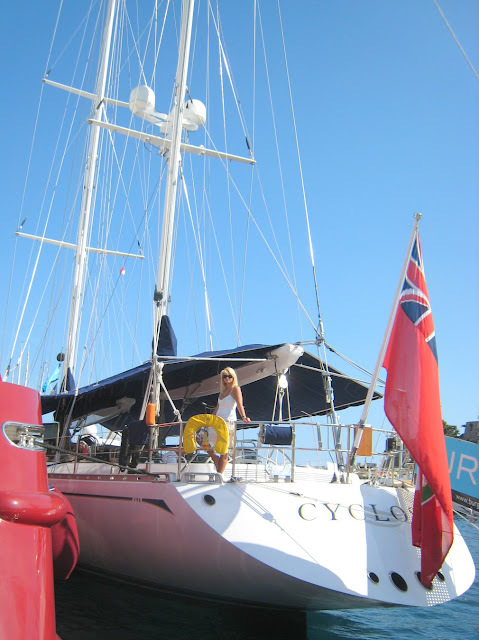 Below you see the Lady Moura, also away from her regular berth. 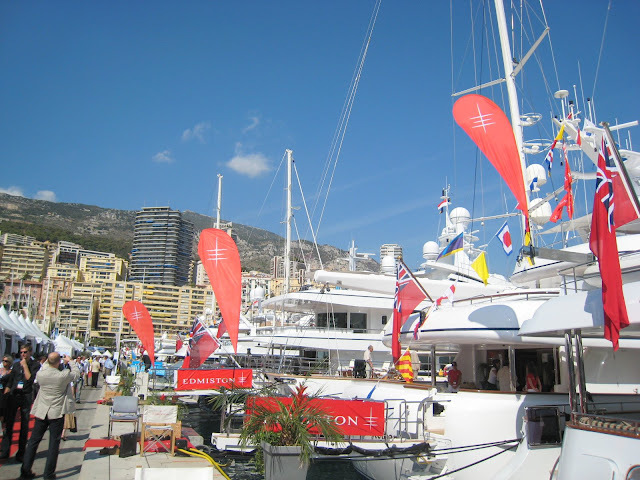 Boats, blue skies, crowds, colour, buzz - but most of all - money, money, money. Monte Carlo is big-time busy at the moment. 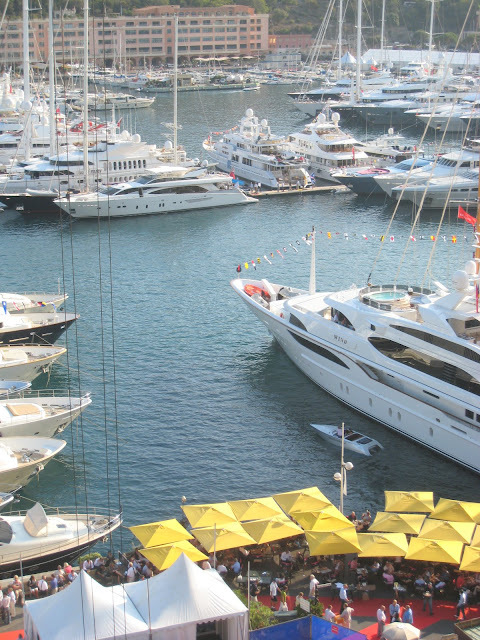 Not a car park place to be had in the whole of the Principality, everything centres around the main port, Port Hercule, for the prestigious Monaco Yacht Show. 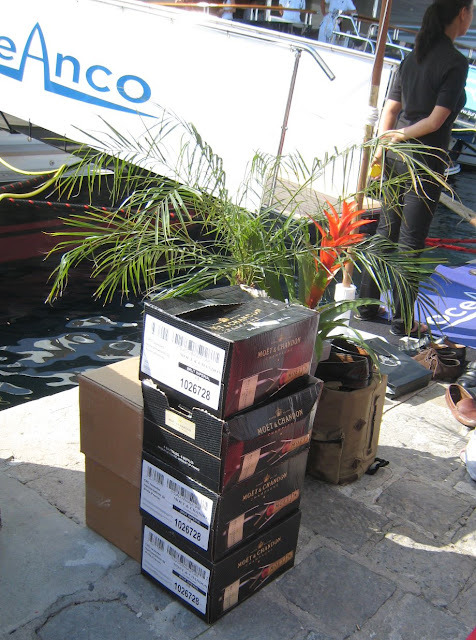 So prepare yourself for a few days of beautiful boats and beautiful people watching. Here you see, on the right, the Wind, all 193 feet (59 metres) of super yacht. Cost to enter the show is 50 euros, half of which goes to a Monaco charity. 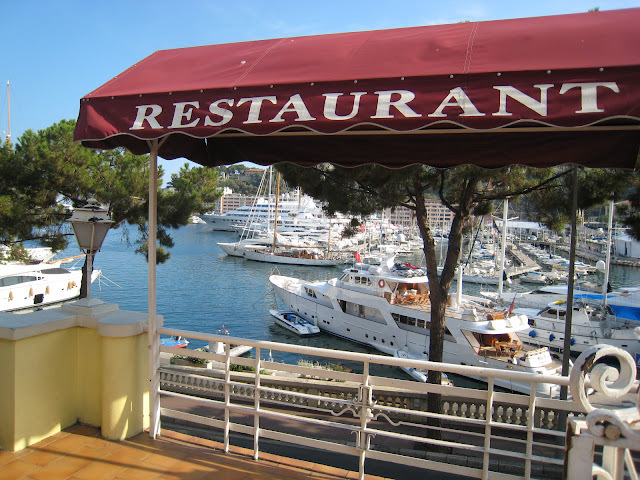 This photo was taken from below the casino area looking out beyond the Princess Grace Theatre and overlooking the port. The vertical wires are from a massive crane. Tomorrow and tomorrow - come back, I've much to show you from the red carpet. The tea house. Trees. Rocks. Water. Peace. Taken from just above the Monte Carlo Country Club (home of the Monte Carlo Masters Series) the Principality of Monaco lies to the right of the photograph. 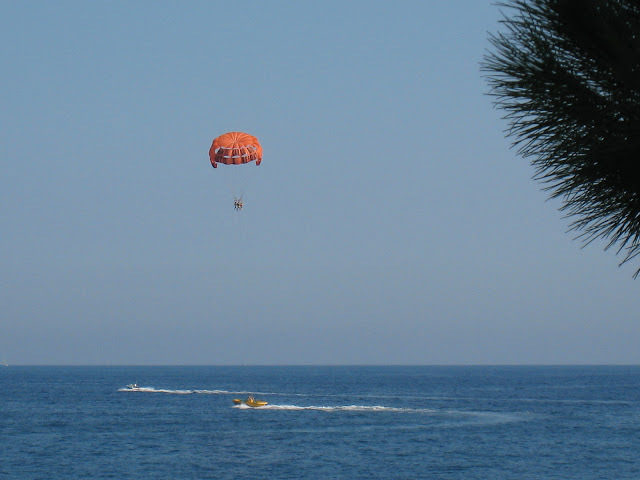 You can see Monaco's newest hotel, the Monte Carlo Bay Resort, standing on the small promontory. 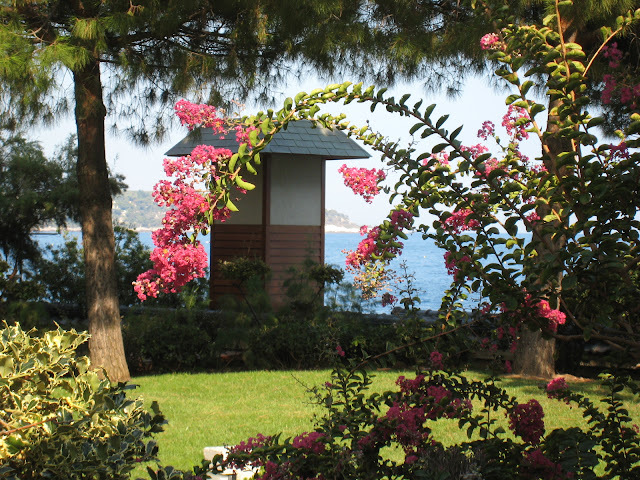 Advertised as 'the most beautiful tennis club in the world,' I don't think they are far wrong, do you? 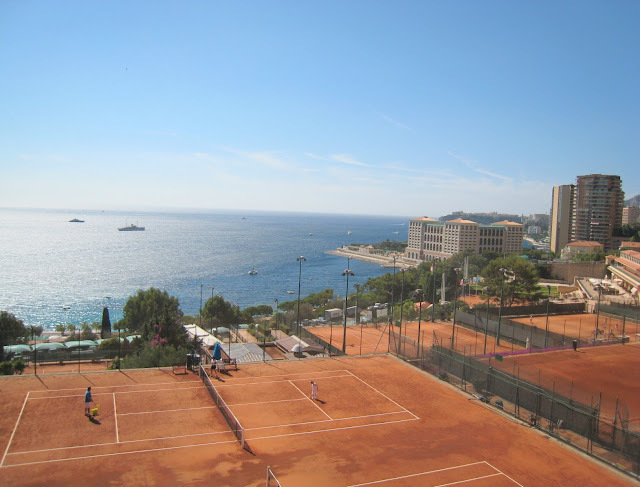 Here you see a father playing tennis with his son, the Mediterranean in all its beauty, below. Notice the little chap in the middle of the photo. He's the Doriana's dog, a wire-haired dachshund. Later I saw him out walking with one of the crew. 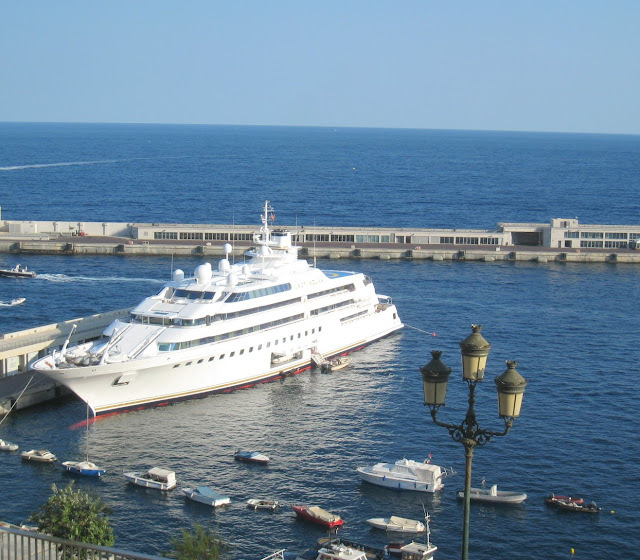 Click HERE to see him stretching his sea legs by the port of Monaco. You can also click on yesterday's link for the Doriana - then on 'photos' and you will find a photo of him (last pic) curled up in the middle of some ropes. A good place to stop, sit on a bench and have a chat - don't you think? The Japanese garden is beautiful but put it in this setting, right by the Mediterranean and it's mind-blowingly gorgeous. 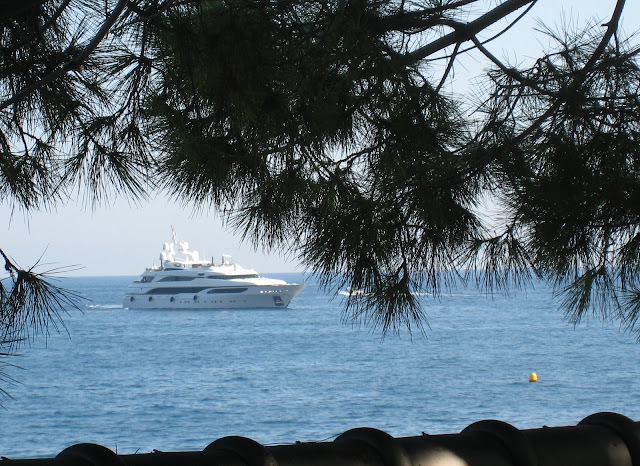 A luxury yacht on its way to the main harbour of Monaco. 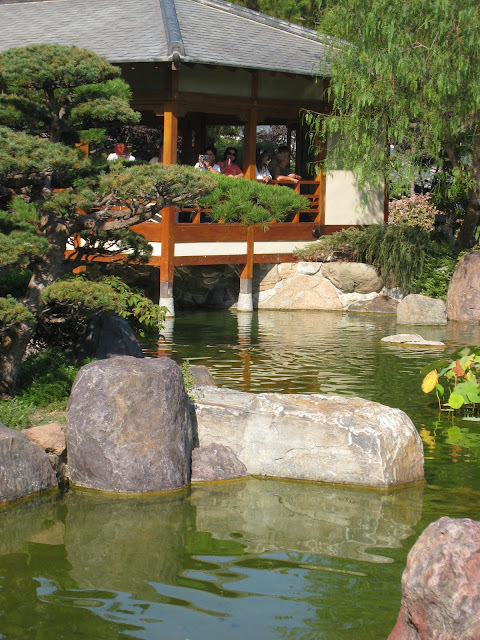 This photo was taken from the beautiful Japanese garden on Avenue Princesse Grace. 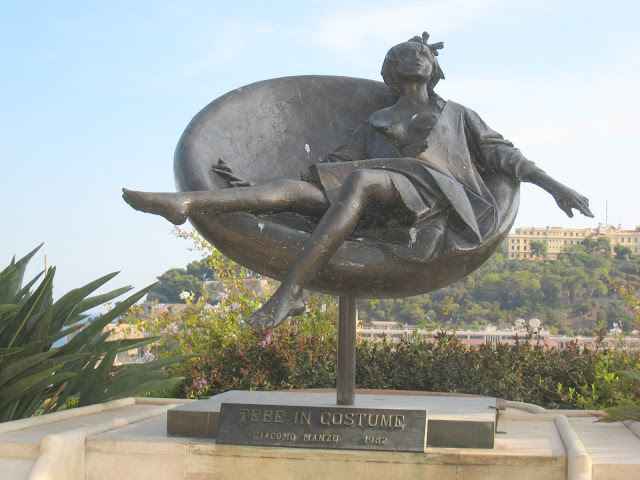 This sculpture stands on Avenue d'Ostende overlooking the main port of Monaco. 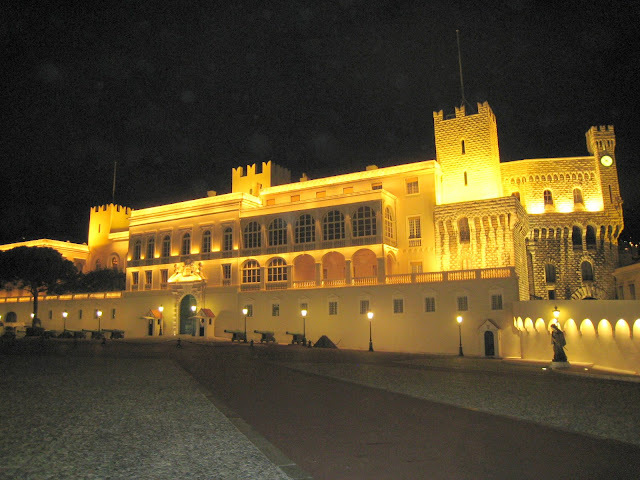 The Palace on Le Rocher is opposite. The artist is the well-known Italian sculptor, Giacomo Manzu (1908 - 1991). 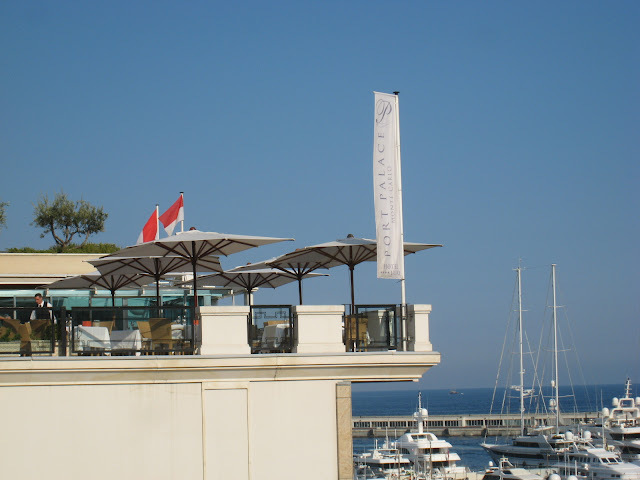 The photo says it all really - a sunny day, sun umbrellas, lunch overlooking the port of Monaco. 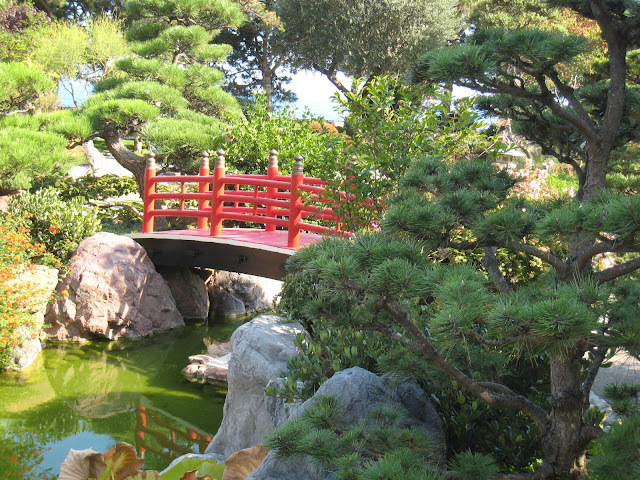 The red bridge in the Japanese garden on Avenue Princesse Grace. You can glimpse the sea through the trees. Friends arrived yesterday on a cruise ship. 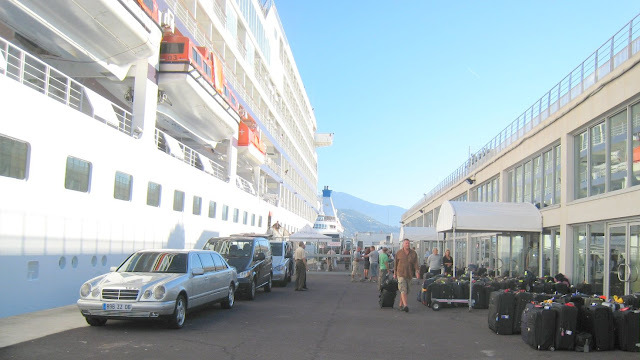 Their ship, Seabourne Legend, is the smaller one at the end and takes only 208 passengers. The monster boat in the foreground is called 7 Seas Navigator and has facilities for 490 guests. This is the first time I've visited the digue (floating dock) - security is tough - I had to pass two sets of police to collect my friends but at the same time they were really friendly. 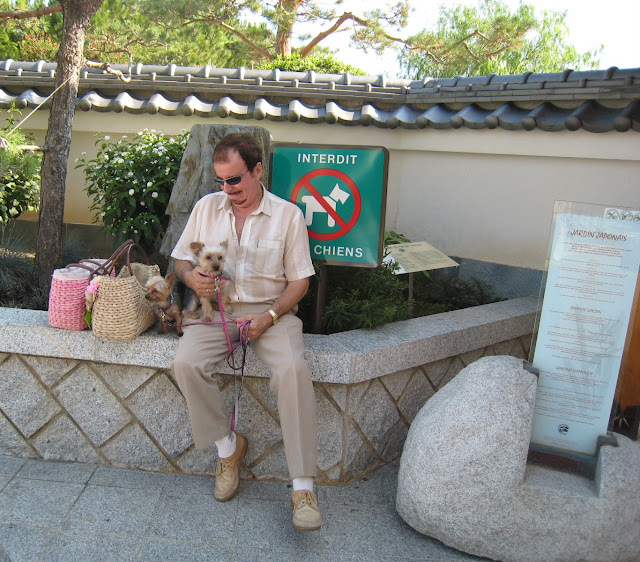 As you can see, dogs are not allowed in the Japanese garden, so the husband waits outside with the dogs whilst the wife looks around the beautiful gardens. Later, I saw this couple walking - one Yorkie was in a basket, another on lead. You can see more photos of these little dogs at Riviera Dogs. 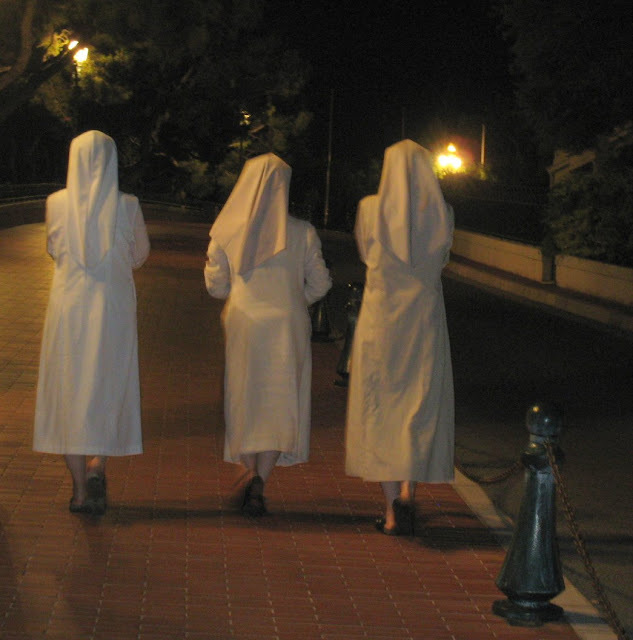 Three nuns out for a night stroll on Le Rocher. They are walking away from the Oceanographic Museum towards the Cathedral. Last Sunday there was an International Ironman contest in Monaco. Competitors came from all over the world to compete in this prestigious triathlon. The winners had already reached Casino Square by the time I took this photo of a competitor running towards the tunnel from Avenue Princesse Grace. Sadly, wickedly, between 12 and 14 bikes were stolen the night before the contest - bikes valued at between 5,000 and 7,000 euros, so some athletes were unable to compete, others borrowed a bike but their performance suffered. An enquiry is taking place. 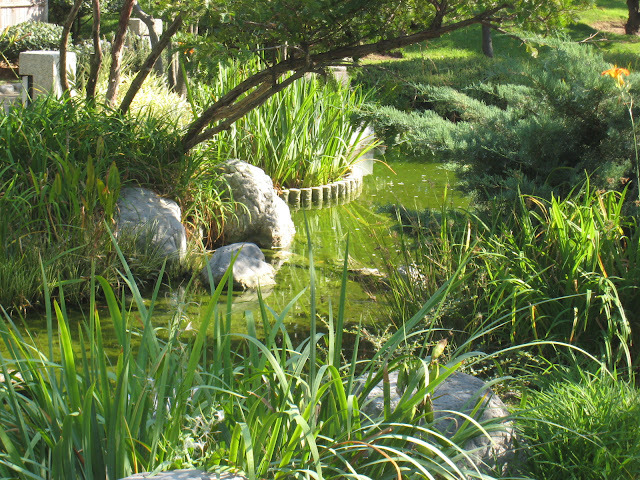 The Japanese garden is just along from the Grimaldi Forum on the Avenue Princesse Grace. 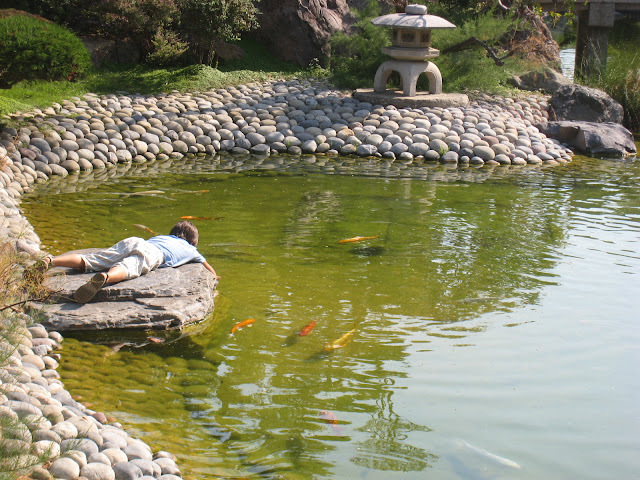 A wonderfully peaceful place to lie face down on a rock and have a chat with the koi carp. This is the view from the bar on the first floor of the Grimaldi Forum in Monaco. 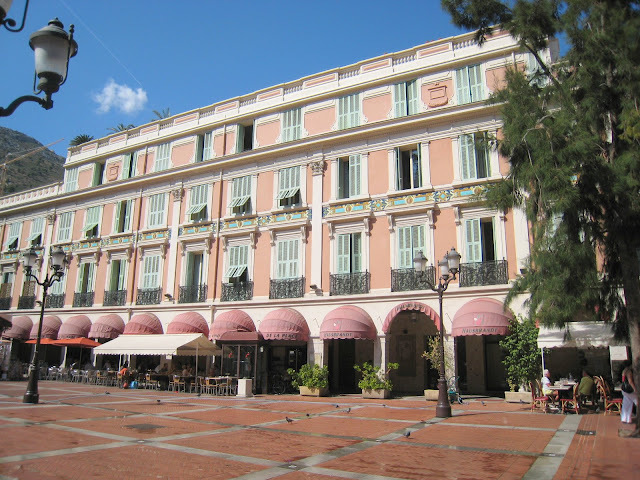 It serves delicious sandwiches and is a great place to have a cool drink before visiting the amazing exhibition called 'The Grace Kelly Years, Princess of Monaco.' This wonderful exhibition, curated by Frédéric Mitterrand (nephew of the former President of France) took two glorious hours to walk around and to say it was moving is an understatement. 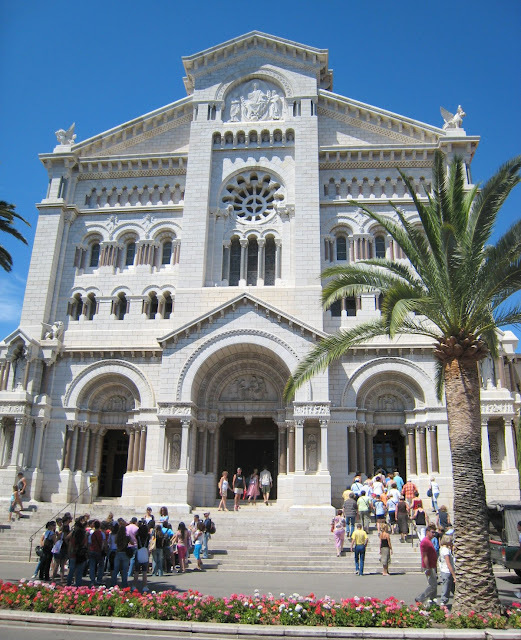 If you happen to be in Monaco whilst it's still on, do visit. The strange looking V shaped object to the right is part of a sculpture standing on a lower level of the building. 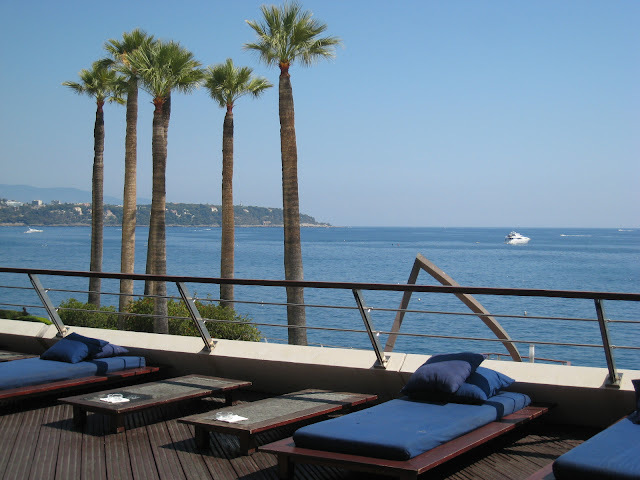 Have a drink in this bar - you can sit at a table, at the bar or relax on one of these sunbeds if you want. 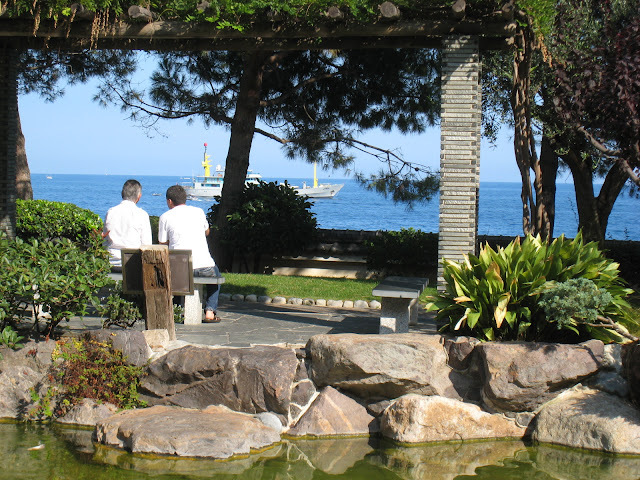 A view from one side of the Japanese garden in Monaco. In the distance: Cap Martin. I'll show you more of the really Japanese part of this beautiful garden another time - today I was in the mood for sea in the background! 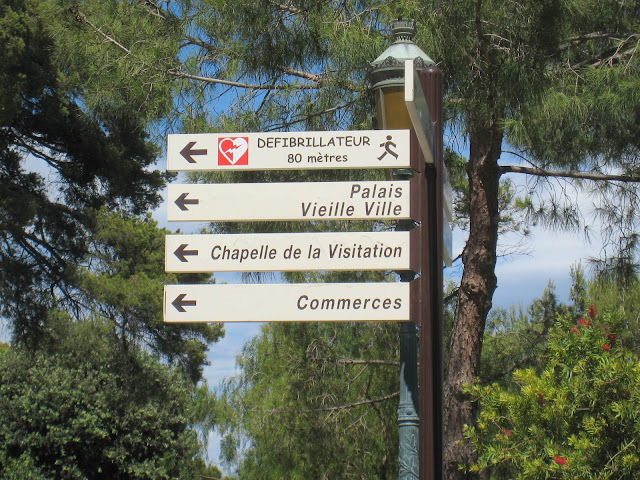 If you have to have a heart attack, then Monte Carlo is probably the place to be - you are never far from a defibrillator. You'll find this group of signs on Le Rocher.